Well, I have my family coming over for dinner tomorrow night. First time that many of them have seen the house. Why would they show up here after 2 years in the house? I decided that instead of heading to my favorite Mexican restaurant Lindo Michaocan for my birthday... I'd do it here. The birthday is a few days later but this worked out well to get them all together. I know... what does this have to do with the items on the counter? Well, I love Mexican food and have decided to have that for dinner so I'm preparing a few things. 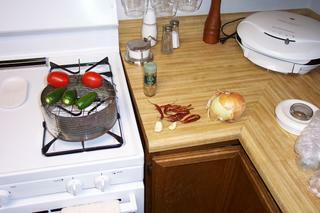 On the table is a yellow onion, 10 chile de arbol, two cloves of garlic, 3 jalepenos, 2 roma tomatoes and some cumin. 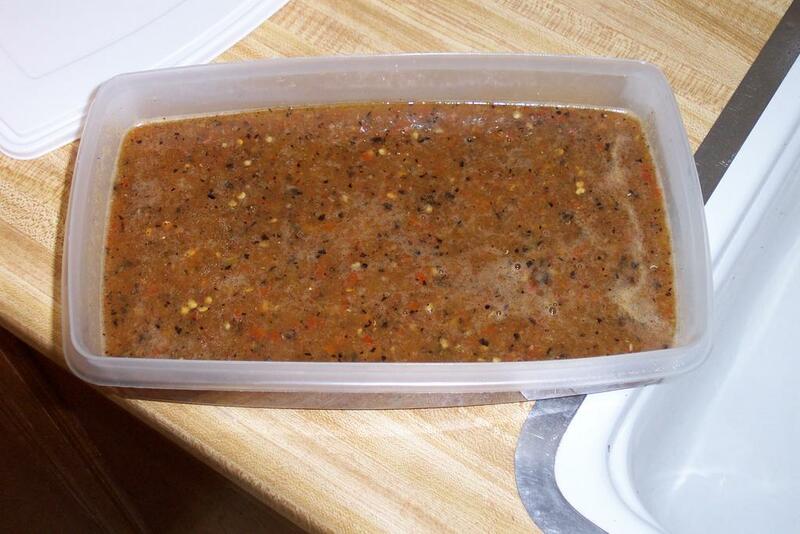 I learned this salsa recipe from a co-worker that works in room service. 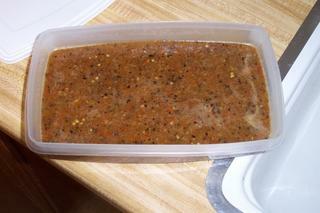 (Ok, it's not truly a salsa because it is all boiled down and has no cilantro.) 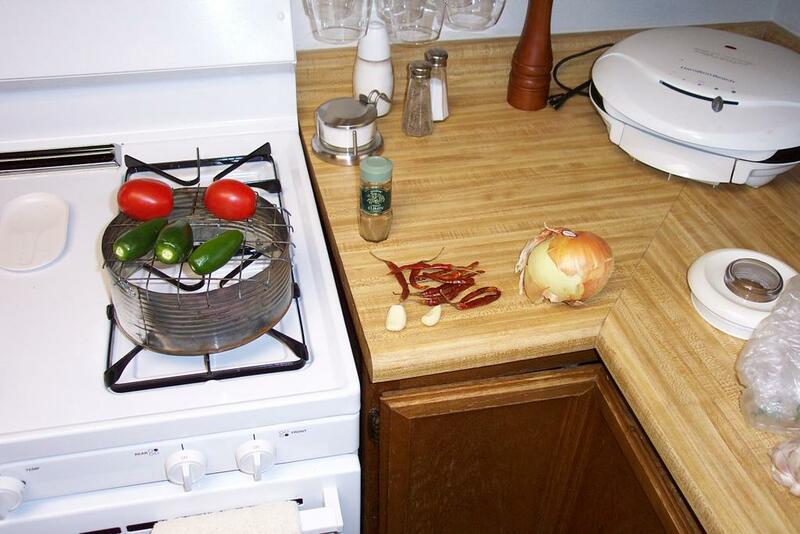 I roast the jalepenos and tomatoes on the contraption on the stove to seal in the flavor. I bring about a cup and a half of water to a boil. Then in goes the cumin, chile de arbol (no stems), garlic and onion (2/3 of the onion.) I add the blackened jalepenos and tomatoes continuing to boil until they are all softened. All the items then go in the blender and get liquefied to what you see in the tupperware. You're cooking your own birthday dinner?? Something doesn't sound right there. Actually it does sound just like you. You're a great cook, it's going to be a fabulous dinner! Enjoy... and share pictures! Looks like good eats. Just in case we forget - Happy Birthday! That sounds really good, but if it's liquefied, how do you get it to stick to the nachos? Save me some leftovers :) That sounds and looks good. Did you use the peppers from the backyard? Lloyd - Nope. I only had the one jalepeno growing so I wanted to give it some time. That reminds me that I need to spray some of the blossoming stuff on those flowers. RT - I have this thing about not seeing what was in the sauce especially tomatoes. It's broken down really well but not too much. Yeah, Leos! Ter - I'm going to hold onto as much of the food as I can. I figure that if we cook too much that I'll be able to live off of it for a few months. p.s. I hope you have a Happy Birthday!! Hey Martin, send me some leftovers! It sounds really good. Happy Birthay! The meal looks great. You've been a wonderful blogmate and I hope you had a wonderful day. The party went great. This was the first time I've ever been able to cook like that for my family. Mom also did a great job with her shredded beef, chicken, taquito casserole and many other items. I was so enrapt with cooking that... I left the camera in the other room unused. I'm kinda upset at that but hope to get a few photos of the kids when I go to my aunt's baby shower on Sunday.